People keep asking me if I’m ready for my son to be born. I think of the mostly empty duffel bag sitting on my bedroom floor and realize perhaps I need to take this countdown to my due date more seriously. With my first baby, of course, I had a typed up birth plan and a printed list of important phone numbers weeks in advance. We had faithfully attended childbirth classes and I packed my hospital bag neatly (with a checklist) at 36 weeks. I created a ‘baby playlist’ and burned CD’s with relaxing music to help me in the delivery room. The crib was up, car seat installed, dresser stocked, and diapers ready long before she was due to arrive. And of course, she was a week late. I’m just about two-and-a-half weeks away now from holding my baby boy, my fourth baby, and so far I’ve packed some socks, an electric teapot, a mug and some teabags. Oh, and some slippers. The truth is that from that first positive pregnancy test and the week you sit all nervous on a doctor’s examination table waiting to see your baby pose for pictures for the first time, all fuzzy in black and white, wiggling limb buds with a heart beating so hard and so fast… you are in preparation. The life grows and sometimes it all rushes by so quickly. Other times (like in those early days of nausea, morning sickness, and awkward weight gain where you don’t look pregnant, but you do look bigger) time creeps on and you feel like this….surely…..will….last……forever. But it won’t, of course. There’s the season of waiting and preparation. Surely, it may have felt like one interminable case of waiting, waiting, waiting on God for Sarah. But more than a decade after God’s initial promise to bless Abraham with a son, Sarah labored and delivered and then held her baby, Isaac, and she laughed with joy. And a young teenage girl named Mary heard the news from angel—she’d bear a son, the Messiah, our Savior. No double lines on a pregnancy test to confirm God’s promises, no appointment at the doctor’s office to test her hormone levels or laying back and waiting for an image on the ultrasound screen. No, it was the leaping of John the Baptist in his own mother’s womb, the Holy Spirit dancing of an unborn babe, that told Mary life was in her, God’s life, long before her clothes stopped fitting and her hands and feet swelled. Her waiting didn’t last forever, though. A night in Bethlehem ended the anticipation and the expecting. All that God has been doing in the hidden places of the womb, the forming in the darkness, the creation we can’t see, pushes right out into the light. Paul wrote in Galatians that “when the set time had fully come, God sent his Son, born of a woman, born under the law, to redeem those under the law, that we might receive adoption to sonship (Galatians 4:4-5 NIV). The writer of Hebrews tells us: But [that appointed time came] when Christ (the Messiah) appeared as a High Priest of the better things that have come and are to come (Hebrews 9:11 AMP). Until then, we prepare, we trust, we pray, we obey the tiny steps and trust God with the results. We marvel and praise Him for the signs that life is growing and maturing within us and it stirs up that hope, that expectancy that yes, God is at work here. And while I’m packing that much-neglected hospital bag, I prepare in other ways for another kind of birth…. One I can share with you. So many have asked, so many of you have faithfully prayed, and here is the first sign that my book, Ask Me Anything, Lord: Opening Our Lives to God’s Questions, will be here soon. It’s been a summer of editing and proofreading, of working with the publicist, and approving the copy. Now, the book is available for preorder with a release date in November! You can follow these links to find the book at Amazon, Barnes and Noble and also at Christianbook.com. You can click here to learn more about the book and what God has already done in the writing and preparing for publication. An e-book version will be available at Amazon, Barnes and Noble and the Apple store shortly after publication. Thank you so much for praying, for encouraging, for blessing me in so many ways. I am so grateful to God for each of you. Heather King is a wife, mom, Bible Study teacher, writer and worship leader. Most importantly, she is a Christ follower with a desire to help others apply the Bible to everyday life with all its mess, noise, and busyness. 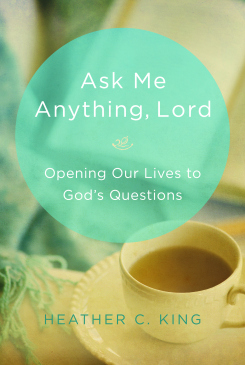 Her upcoming book, Ask Me Anything, Lord: Opening Our Hearts to God’s Questions, will be released on November 1, 2013! To read more devotionals by Heather King, click here. Wow! Congratulations! Amazing…and all with a baby on the way. All I can say is WOW! I feel like I’ve said “Wow!” to God so many times. He amazes me and I’m so thankful to Him. Thanks for the well wishes! Congratulations to you!! I remember my first. Being excited and nervous at the same time. Getting prepared early. Of course he was almost 2 weeks late! Then with my second I figured I had more time so I did not pack so early. I waited until the last week! I wish you all the best with your new baby boy!! I can’t wait to see pictures! Your prayers mean so much! Thank you! We are so excited awaiting the arrival of both of your “babies.” May God’s blessings be on both! Was the beautiful “blue” cover design chosen before or after you knew you are carrying a little boy? I didn’t even think about the blue book cover! The publisher picked that long before we found out we were having a baby boy. How fun!